This winter has been very mild in Seattle, but the morning of the race it was in the 30s. 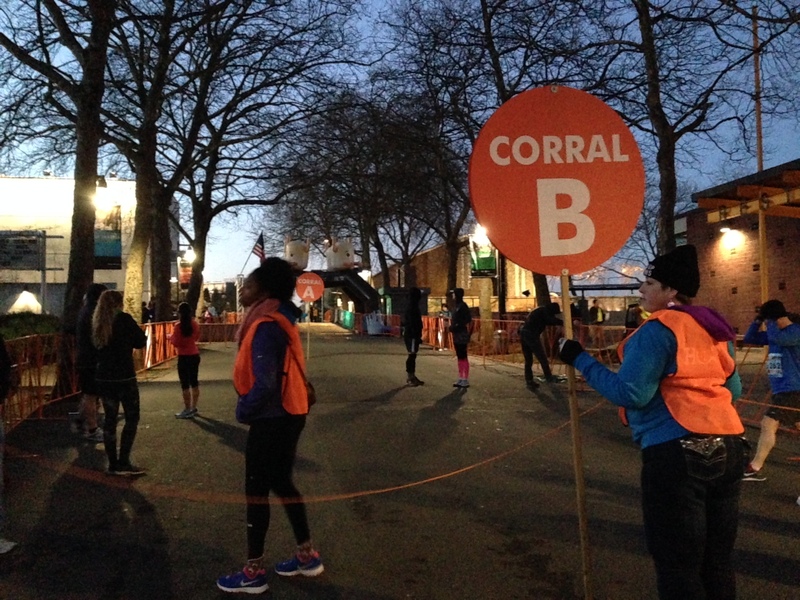 I got to my corral way before the start time, due to the jet lag, and waiting in my assigned corral B. I was aiming to finish the race in less than 30 minutes. I knew that I need to run about 9:30 min/miles in order to make this goal. I started out strong, but was very cold. I never warmed up during this race and wish that I had worn my winter running gloves and hat as my hands and body were freezing. After about 3/4 mile I had to take my first walking break as there was a large hill. I got up the courage to start running some more but had to take a few more walking breaks during the race knowing that I had a large hill at the end. I got to the dreaded Mercer Street hill that I faced during the Rock n Roll Half Marathon and was able to run half of it. Overall the course takes you to downtown, stops at Pikes Place Market, loops back up onto 99 and through the tunnel and up Mercer st. There were several hilly bits and my poor jet lagged non trained body was just not prepared. I finished in 31:40. Very disappointing, but finished in the top 5th of my age group which was a nice surprise. For the 5K you get a nice fleece lined hoodie and some chocolate goodies at the finish line. You do not get a medal, you have to run the 15K to qualify for that. For next year, I am hoping to train and run the 15K as the medal was pretty cool, plus the 15K has a later start which would lead to warmer temps. Below are a couple of photos I captured before and after the run.